– The Rescue Ambulance is fully pre-assembled and equipped with a trailer hitch. - As is standard for 1.2.3 vehicles, there is a towing latch on the front of the vehicle. - The driver's cab offers space for a 1.2.3 figure (1.2.3 child figure also possible). - The rear door can be folded out at the side and engages when it is closed. - The patient bench in the ambulance attachment is designed for a 1.2.3 adult figure or 1.2.3 child figure. The figure is put in diagonally and the doctor's bag can be placed in front of the figure. Price is 20% below the initial Playmobil retail price, a € 3.00 discount! The Rescue Ambulance (9122) Playmobil set is available from the sites below. However, they do not offer delivery to your selected region. 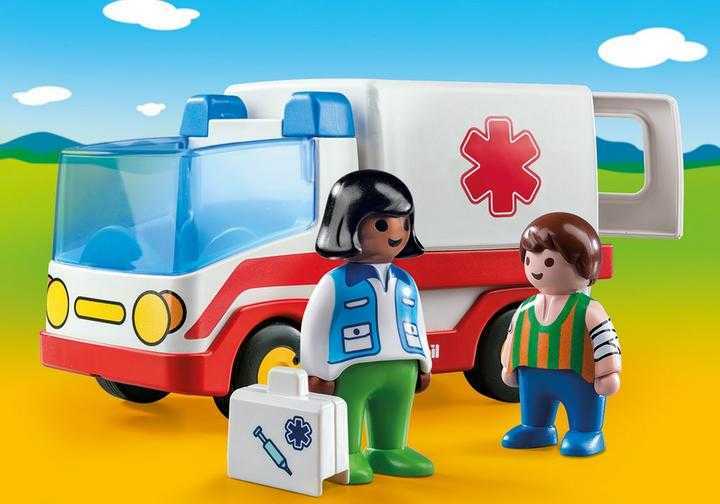 The Rescue Ambulance (9122) Playmobil set is no longer directly available from the sites below. However, 3rd party partners of these sites might still have the set available. Alternate description The rear door opens.